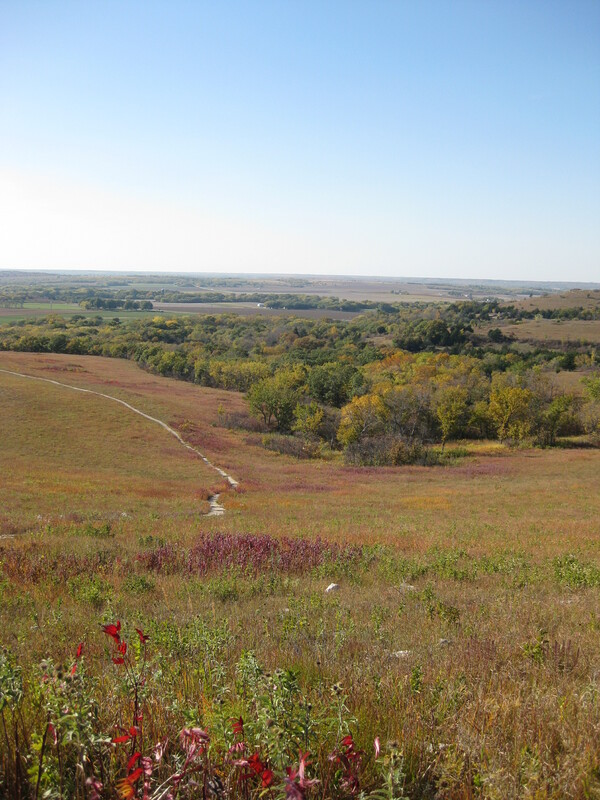 Autumn colors at Konza Prairie. Among the things that linger from a Catholic upbringing are songs from Sunday mass. One can hear those songs thirty years hence and still remember them word for word, note for note. We hold a treasure, not made of gold, in earthen vessels wealth untold. The hymn is based on a passage in 2 Corinthians that likens our bodies to earthen vessels, the treasure within being the presence of God in our hearts. Today I find myself reflecting on the fact that there are many earthen vessels in this world that hold many treasures. All too often, these treasures go unnoticed and under appreciated in the busy, self-serving rush of our lives. Konza Prairie is one of those treasures, held in an earthen vessel of shale and limestone laid down by millennia of rising and falling seas. Superimposed upon this bed of hidden fire and tiny fossils is a thin rocky layer of soil that supports one of the few remnants of tall grass prairie in North America. I had the privilege of immersing myself in this rich environment, along with my colleague Dr. Amy Milakovic and eleven adventurous students who enrolled in our new course Ecology Through the Writers Lens at Avila University. 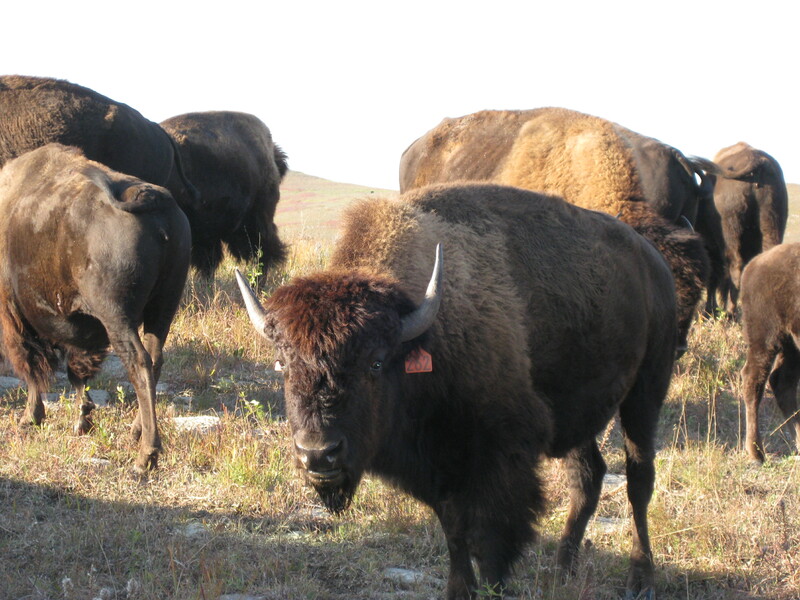 Bison keeping an eye on us as we pass through their home. For three very intense days, we explored a mysterious intertwining of the minuscule with the vast. We learned that all grasses are not alike, that the summation of a thousand subtle colors results in an intensely vivid landscape. We looked bison in the eye and held a horned lizard in our hands. We studied tiny insects and spiders and watched deer leap across fields. Turkeys danced and fought in our presence. Coyotes called at night. Overhead, the stars glimmered with the promise of an even greater universe. All of us were transformed by this experience in big and small ways. Some students overcame fears of wilderness and the unknown; others found their vocation as biologists or story tellers, or both. Everyone came away with a new appreciation of this magnificent ecosystem that unfolds over quiet hilltops and under expansive skies. Those of you who follow me know it has long been a dream of mine to implement this course. The idea was sparked by my residency at Andrews Experimental Forest back in the summer of 2011. We have faced no small number of obstacles trying to turn that dream into reality, including one failed attempt to take the course to Costa Rica last spring. As often happens in hindsight, now I look upon all those obstacles and moments of frustration as blessings in disguise. Every time we were turned from a particular vision of how to run this course, we were brought a step closer to its current manifestation in Konza Prairie – a field site that I would not have considered even a year ago, but that has proven so wonderfully appropriate in so many ways. Now that I’ve seen the treasures within Konza Prairie, I cannot imagine having done this course anywhere else. I am so happy you got to do this. I know how much it meant to you. It seems like a truly life-altering experience. When I was much younger, I took a watercolor painting course. I am no undiscovered talent, but I did ok. What I learned in the class, however, has carried over well into writing. Like you learned grass isn’t just grass, I learned that color is far more than what we take in at first glance. A sunset looks pinky purple, but if you look more closely, you see that the horizon line is orange and golden, a little higher up and you get alizarin crimson, cerulean blue mixing with prussian blue and the alizarin to get that shade of purple only the sky can have. I have never looked at a story sky wihout seeing all the myriad of grey and blue that create that sort of glory, and you’ll never look at that vast expanse of grass again as simply amber waves. It makes us SEE deeper. I love it. One of our students this past weekend is also an artist, and she saw SO much that the rest of us would have missed without her. Writing, drawing, scientific observation – all of these help us to pay attention to details in different ways. We found they are very complementary during our stay at Konza, and as you point out, one feeds into the other. 🙂 I would have loved to have seen some of your watercolors, Terri. Next time you are here, Karin, I’ll show you my bluebird. It’s the best I did, and I’m pretty proud of it. I still have it, twenty years later! Beautiful video, and inspiring post! I wish I could take the class!